INS Viraat (Hindi : भा नौ पो विराट, from Sanskrit Virāṭa meaning Giant) is a Centaur-class aircraft carrier in service with the Indian Navy. INS Viraat was the flagship of the Indian Navy before INS Vikramaditya was commissioned in 2013. The last British-built ship serving with the Indian Navy, she is the oldest aircraft carrier in service in the world and is one of three carriers based in the Indian Ocean region. Viraat was completed and commissioned in 1959 as the Royal Navy's HMS Hermes and was transferred to India in 1987. She was commissioned on 12 May 1987. In 2009 there were reports that after that year's refit was concluded, India might keep the aircraft carrier in service until 2020. By then, the warship would have completed 60 years of service, over twice its initially estimated sailing life of 25 years. At that time the two Indigenous Aircraft Carriers (IACs) seemed likely to be fully operational, which was the reason to keep Viraat operational until then, according to unnamed Navy officers. However, the warship's age and cost of maintenance later prompted naval headquarters to consider decommissioning Viraat by 2017 or sooner. 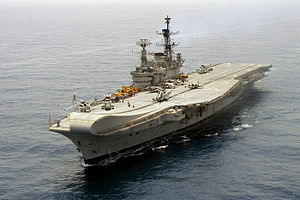 In February 2015, the navy announced plans to decommission Viraat in 2016, and began the process to obtain Defence Ministry clearance for the carrier's decommissioning.